Montparnasse Cemetery is located near the railway station Gare Montparnasse and tower. 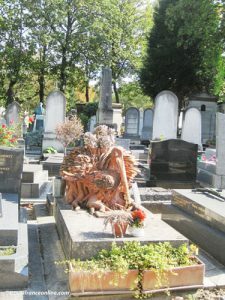 It is one of the four Parisian cemeteries that were created in the 19th century in order to replace the city’s parish cemeteries. These were indeed closed in order to avoid sanitation issues. It opened on July 25, 1824 as Cimetière du Sud. This southern area of Paris was then located outside the city's fiscal boundaries - Mur des Fermiers Généraux. It was mostly agricultural land dedicated to wheat culture and was therefore dotted with countless windmills. Most villagers either worked in the milling industry or exploited the local lime quarries. Many cabarets, inns, guingettes and entertainment places appeared in the vicinity of the fiscal gates Porte de Montparnasse and Porte du Maine. 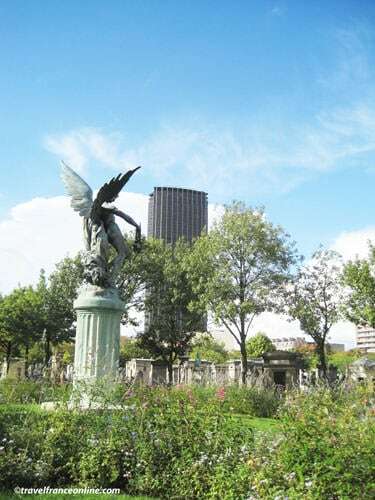 The land on which Montparnasse Cemetery was opened belonged to the monks of the Hôpital de La Charité. The religious community had already open a small private burial ground on the plot. The monastery and hospital became national property at the French Revolution and were pulled down, but the Moulin de la Charité, the old flour mill was fortunately kept. It was indeed transformed into a guinguette, because it was adequately located near the Porte Montparnasse! It became the caretaker's lodge when Montparnasse Cemetery was opened. The windmill has long lost its wings but it's still there and has since been classified Historical Monument. 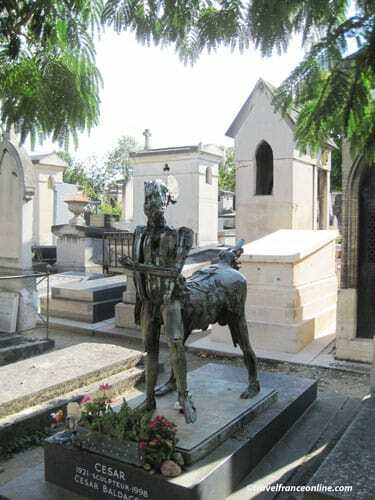 The 19-hectare Montparnasse Cemetery has retained it original geometric laid out. Tree-lined alleys delineate the various divisions. It contains over 40,000 graves and is the second largest cemetery in Paris after the Père Lachaise. It is planted with over 750 trees and bushes and is also one of the greenest spaces in Paris. It consists of two cemeteries delineated by Rue Emile Richard, a street bordered by century-old trees. The eastern section is almost triangular shaped and simply known as Petit Cimetière. The large section is rectangular and known as Grand Cimetière. You'll find many graves bearing the Star of David in the divisions no5 (Petit Cimetière) and no30 (Grand Cimetière). These sections were indeed initially reserved for the Jewish community of Paris. The Grand Cimetière is laid out around a central lawn. The allegorical statue of the Génie du Sommeil Eternel (Eternal Sleep) by the sculptor Horace Daillion marks the center of the lawn. 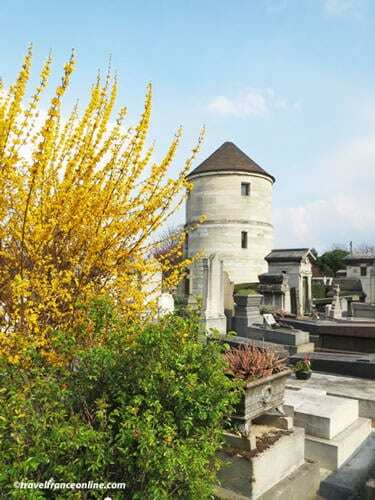 From there, you'll see the beautifully restored Moulin de la Charité peeking above the graves. Montparnasse Cemetery contains a wealth of funeral art objects and adornments. Some, such as L'Oiseau (Div18) and Le Chat by Nicki de St Phalle (Div6), are quite unusual. 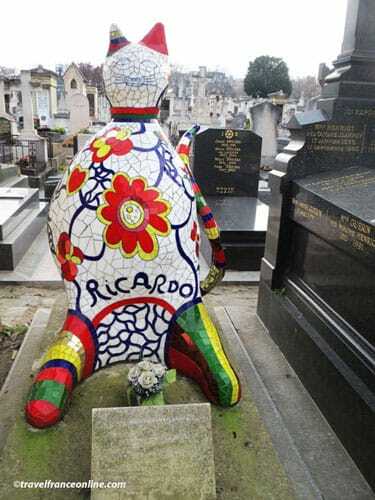 The French artist created the 1.50 m tall colourful mosaic representing a cat for the tomb of her assistant and friend. Ricardo Menon who died in 1989. "À notre ami Ricardo qui est mort trop tôt, beau, jeune et aimé." "To our friend Ricardo who died too soon, beautiful, young and loved." Le Baiser is another unique monument. It is very representative of the contemporary style of the Romanian sculptor Constantin Brancusi, who is buried in the cemetery. You'll also find many memorials such as the Défense Passive in Div4. The Monument de la Préfecture de Police is located in Div27, along the Rue Emile Richard and near the Baudelaire Cenotaph. The Monuments à la Mémoire de la Guerre de 1870, de la garde Républicaine et des Sapeurs-Pompiers are located in the centre of the Petit Cimetière. 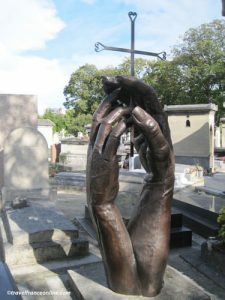 Who is buried in Montparnasse Cemetery? It indeed contains the graves of many French and foreign celebrities and artists of the 19th century, early 20th century and the inter war. They were the people who deserted Montmartre in order to live in the cheaper Montparnasse district and neighbouring St-Germain-des-Prés. It is impossible to name them all, but here are a few. Charles Baudelaire is buried with his mother and step-father in an understated grave (Div6). 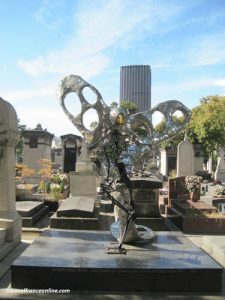 The sculptor Jose de Charmoy created Baudelaire memorial in 1902. You'll find it between Div26 and Div27, along the wall flanking Rue Emile Richard. It represents a recumbent statue lying in front of a column topped with a bust of the poet. Baudelaire is represented grimacing and meditating, with a bat next to him. 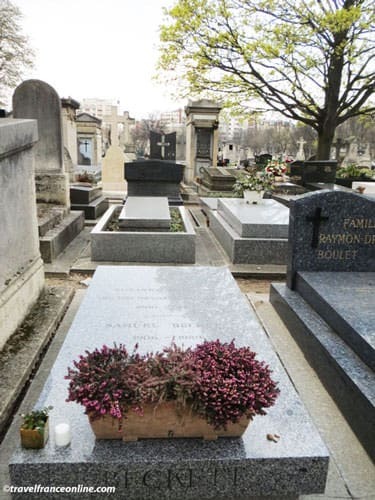 Simone de Beauvoir and Jean-Paul Sartre were buried together (Div20). Their grave is just to the right of the entrance on Boulevard Edgar-Quinet. Both authors and philosophers were the leading figures of the Existentialist literary movement. Their name is forever linked to the Saint-Germain-des-Prés of the inter war. Jaqueline de Romilly (Div10) became the first woman member of the Académie des Inscriptions et Belles-Lettres in 1975. She became the Academy's President in 1987. 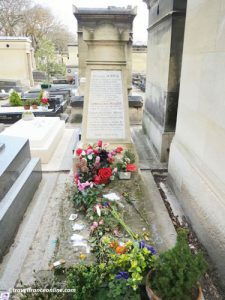 Marguerite Duras is buried in Div21. She was internationally acclaimed for her novel The Lover that earned her the Prix Goncourt in 1984 and was made into a film. 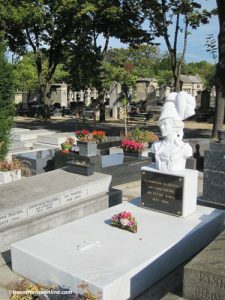 Guy de Maupassant, who is considered one of the precursors of the modern short story literary style, was buried in Div26 (Petit Cimetière). You'll find the black marble tomb of Samuel Beckett in Div12. The Irish avant-garde novelist indeed spent most of his life in Paris. Influenced by Kafka, he wrote mostly in French and is worldwide known for his play Waiting for Godot. The playwright Eugène Ionesco, one of the prominent figures of the French Avant-garde theatre, was buried in Div6. Interested in sculpture, architecture and music? 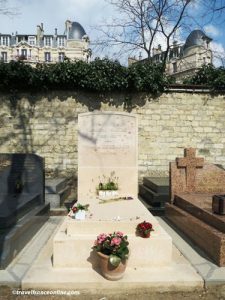 You'll look for the graves of Antoine Bourdelle (Div15), Constantin Brancusi (Div18), Jules Dalou (Div4) (Le Triomphe de la République on Place de la Nation), Antoine Etex (Div7) (La Resistance and La Paix high-reliefs on Arc de Triomphe) or François Rude (Div1) (La Marseillaise high-relief on the Arc de Triomphe). 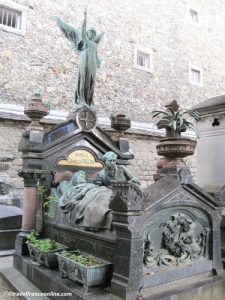 Frédéric Auguste Bartholdi, the sculptor of the Statue of Liberty, designed his own grave (Petit Cimetière-Div28). A red porphyry obelisk topped with a bronze statue of an angel soaring into the sky marks his grave. Cesar Baldaccini, simply known as César, was a leading artist in welded-metal sculpture. He is worldwide known for his Pouce (monumental thumb) in La Défense, and of course for creating the trophy of the César du cinéma. You will find the grave of Charles Garnier, the architect of the Opéra Garnier in Div11. 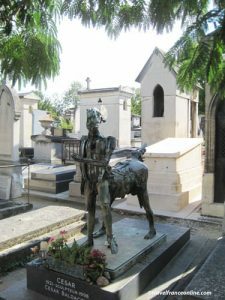 The composer Camille Saint-Saëns, known among other pieces for its Carnival of Animals, Danse Macabre and Samson and Delilah, is buried in Div13. Familiar with 20th century' show business French celebrities? You'll then look for the graves of filmmakers Jacques Demy, Gérard Oury, Eric Rohmer and Claude Sautet. And those of the comedians Jean Carmet, Philippe Noiret, Jean-Claude Pascal, Serge Reggiani or Laurent Terzieff! 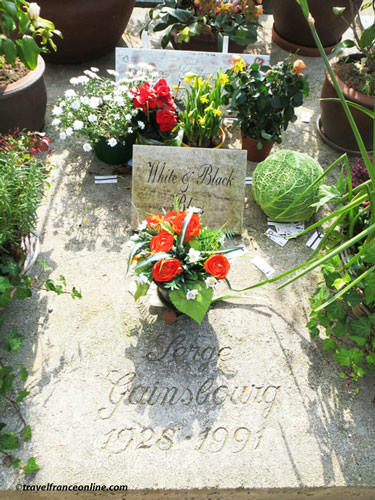 The grave of the singer songwriter Serge Gainsbourg's tomb (Div1) is one of the most visited. It is always covered with amazing offerings! The day I visited there was a cabbage; I'm sure Gainsbourg would have liked it! 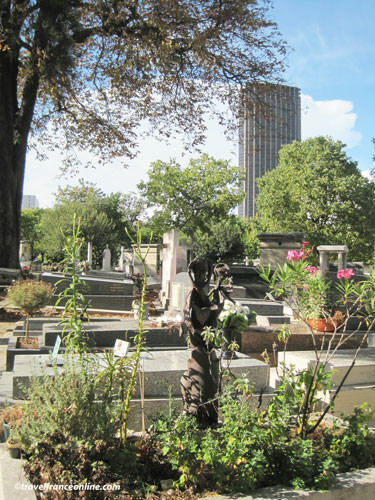 Many foreigners who loved and lived in Paris, were buried in Montparnasse Cemetery. 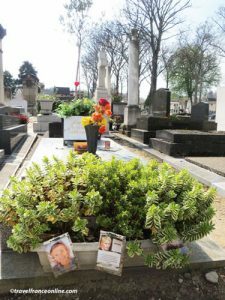 You'll certainly be moved when you find the tomb of the American actress Jean Seberg (Div13). Dead at the age of 41, she remains forever young. Another sad precocious death was that of the American singer Joëlle from the band Il Etait Une Fois. She indeed died at the age of 29; she is buried in Div7. You'll find also the graves of many politicians, publishers, people of the medical world or patrons of industry such as the car manufacturer André Citroën who is buried in the family vault (Div28 - Petit Cimetière). Most graves, though, are those of generations of anonymous Parisians! Their graves are traditional, unusual, fun, amusing, moving and endearing. Some are abandoned (no more family I guess!). However, they all tell us, famous or not, the story of their 'resident'. Stroll along the alleys of Montparnasse Cemetery, take the time to visit them. You need at least a couple of hours, but half a day is more realistic. 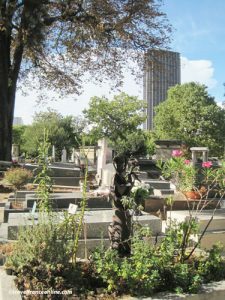 Finally, before you leave Montparnasse Cemetery, don't forget to visit the grave of the historian, philosopher and politician Edgar Quinet. In 1831, Quinet published Le système politique Allemand - the German political system, a book in which he foresaw the future hegemony of Prussia. His tomb is in Div11.